The Michael Leonard 5/6 year olds started us off bright and early. Fraser Duffy had one fence down but still came out on top! He finished on 29.0, riding Fernhill Ultimate. Louise Codd was clear and took second place, finishing on her dressage score of 36.0. Fraser also took third place on Sea Top Boy, finishing on 38.8. Susie Berry moved up a place to win the CCNP** on a score of 56.9. Well done Susie! Harry Meade was unlucky in the CCI*, with three fences down, so Luke Drea took the red rosette for Ireland, riding Gorsehill Pearl and on a score of 42.9. 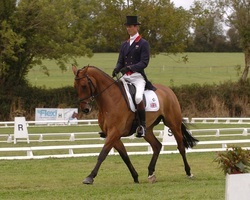 Captain Terence White was second on Owltown, finishing on his dressage score of 45.2. Matthew Wright moved up from seventh to third on Tabatha Bay, finishing his day on 46.9. The CCIJ* was won by Jodie O’Keeffe on Kachemire Le Beau, who performed brilliantly, finishing on her dressage score of 38.8. Jane Hannigan took second spot, with one fence down, and Ian Cassells had two down but came third, finishing on 57.0. The top three in the CIC** class all finished on their overnight scores. Brian Morrison took the top honour on 46.1, with Jaroslav Hatla of the Czech Republic coming in second on 48.7 and Captain Geoff Curran in third place on 51.3. Matthew Wright picked up another rosette, winning the CCI** class on his dressage score of 45.2. Jo Andrews dropped to second, with two showjumps down and Orlaith Delamere had a clear showjumping round, moving up from fifth to third. The crowds had gathered to watch the three star classes and they were really exciting, as the testing showjumping track caused lots of problems! 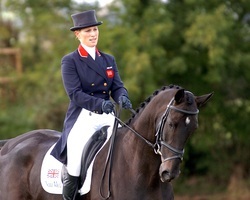 Zara Phillips was a popular winner, with a super showjumping round, finishing her weekend on 57.6. Izzy Taylor had two showjumps down but held onto second place on 62.8 and Sian Wynne Morris had a great clear which moved her up from seventh to third place on 64.0. It was a spectacular end to four days of great competition! Thank you to the competitors, to our sponsors, to our volunteers and to our spectators. We hope you had fun and we’ll see you next time! We’ve had showers today it’s cold so everyone’s wrapped up warmly! Steven Smith, riding Ballylurgan Imp was first to take on the CCI* track. The brush to brush corner caused a few problems, as did the step to roller but the top 3 from yesterday went around in style and hold onto their positions. With less than four penalties separating Harry Meade (GBR) (1st) and Luke Drea (IRL) (2nd), Harry will be hoping that he goes clear tomorrow, and Luke will presumably be hoping that he doesn’t! Jodie O’Keeffe went clear in the CCIJ one star, and would have to knock three fences tomorrow to lose the top spot. The placings in the CCNP** are Kelly Hutchinson in the lead with Susie Berry 1.2 behind. The Michael Leonard 5 & 6 year old CNC* track was testing and three riders were eliminated. Fraser Duffy had no problems though. He was one of only two riders to stay on their dressage score. The other was Louise Codd, whose great performance this afternoon moved her up the placings from eleventh to seventh. The CCI*** leaderboard has changed too. Karin Donckers (BEL) has kept her second place spot but Chloe Newton (GBR) was clear within the time and jumped from ninth to first place. 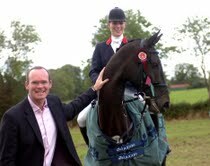 Best of the Irish Is Declan Cullen on Glenhill Gold (54.4), who is in third place. With less than two penalties separating these three, tomorrow’s going to be interesting! Jo Andrews (IRL) held onto her overnight lead in the CCI**, She’s now on 41.2. Matthew Wright (GBR) has moved up one place to second, and goes into tomorrow on 45.2. Anna Hilton (SWE) went clear cross country and has jumped from 7th to 3rd. Zara Phillips (GBR) has overtaken Giovanni Ugolotti and is now at the top of the CIC*** leaderboard on 53.6. Izzy Taylor (GBR) has jumped from fourteenth to second and is on 54.8 (Briarlands Matilda). This will be another nail biter tomorrow! Best of the Irish is Ciaran Glynn on 60.0, who’s in third place overnight. The skies looked threatening this morning and there was a really heavy shower at about 8.30am but the storm clouds had passed before the first competitors arrived at the Main Arena. In the CIC*** class, Giovanni Ugolotti (IT) took an early lead on 44.2. He held onto it all day but Zara Phillips (GBR) on 47.2 and Karin Donckers (BEL) on 47.4 are hot on his heels. The best of the Irish is Steven Smith on 48.6, so it’s all still to play for! The riders meeting is over, so we’re all ready for dinner…it’s been a long day! We’re looking forward to an exciting day tomorrow. The track looks fantastic, so do come down and join the fun! After a late night, the team was up bright and early to make sure everything was ready for day 1 of the competition. The ground was perfect, the weather co-operated and the arena looked great! Karin Donckers, from Belgium, who won the dressage challenge on Tuesday, was first into the CCI*** arena on SS Jett. She scored 51.6 and held onto the lead until lunchtime. At that point, Harry Meade, from Great Britain, was leading the CCI* class, on a score of 40.2, riding A Modern Duchess. SS Jett dropped to 5th in the afternoon but Karin finished the day in second place on Lamisell Charizard (46.0). Lying in 3rd place at the moment is Anne-Marie Styles from New Zealand on As You Like It (48.2). 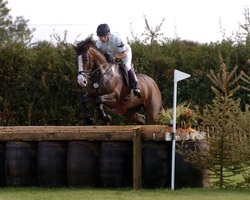 Our overnight leader is current world number one William Fox-Pitt, who finished today on an impressive score of 43.2. The best placed Irish riders are Declan Cullen, riding Glenhill Gold, in 8th place and Sharon Reilly, riding Triple Point in 10th place. Harry Meade held onto his lead and is our overnight leader in the CCI* class. Irish riders Luke Drea, riding Gorsehill Pearl (42.9) and Brian Morrison with Theia (45.0) are 2nd and 3rd respectively. The riders will face the cross country track on Saturday and that might shake things up a lot…we’ll keep you posted! We’ve seen some fantastic horses and riders in action today and hope you like the photos! We were delighted that the weather co-operated and the ferries ran, so all the foreign competitors arrived safely! 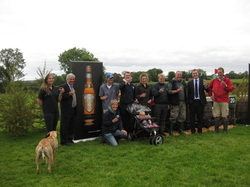 The rider’s briefing was followed by a walk to the Irish Distillers reception at the last fence (though obviously some people ran!). The first trot up started at 3pm and riders and horses were beautifully turned out. Everything went well and we’re looking forward to the competition getting underway tomorrow morning, with a 10am dressage start for the CCI*** and CCI* classes. 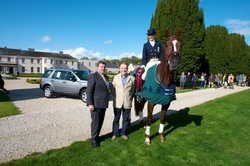 The Johnson & Perrott Land Rover International Horse Trials got off to a sunny and exciting start this afternoon. Some of the best rider/horse combinations due to compete over the coming days, battled it out in a winner takes all Dressage Challenge at Castlemartyr Resort. The competition and the €1,000 prize fund was won by Karin Donckers, who completed an impressive test on her thoroughbred stallion, Lamicell Charizard. Karin, who competes regularly for Belgium, is competing on four horses this week at Ballindenisk and is already looking forward to her next dressage challenge, which will be on Thursday. Ballindenisk, near Watergrasshill, is one of the country’s premier horse trials venues and the organisers are looking forward to welcoming riders from twelve countries, who will compete on 180 horses over four days of international competition. It will be an exciting few days, with the opportunity to see some of the world’s best riders in action, including William Fox Pitt (three times World Number One), Zara Phillips (Former World and European Champion) and Ireland’s most successful eventing team, Michael and Patricia Ryan, who have represented Ireland at European, World and Olympic Championships. Dressage takes place on Thurs/Fri, Cross Country on Sat and Showjumping on Sunday.